Welcome to the Frisco Lodge Bed and Breakfast, "Your Home Away From Home," offering fabulous hospitality and service, richly appointed guest rooms, gourmet culinary delights, and incomparable historic ambiance. Our location, in the heart of Summit County, with Frisco’s unparalleled easy access to the six world-class resorts of Breckenridge, Copper Mountain, Keystone, Arapahoe Basin, Loveland and Vail that surround the town, provides easy access to the area’s dazzling winter recreation opportunities; whether you’re seeking an exciting Alpine or Nordic adventure or simply relaxing in our winter wonderland. We are located on Frisco’s Historic Main Street - “The Main Street to the Rockies” with just an easy stroll to Frisco’s finest dining, shopping, and nightlife. Each morning, guests awaken to a delicious full breakfast. While savoring breakfast, enjoy yourself with friends and acquaintances from around the world in the cozy breakfast room or at the living room’s community dining table. Each afternoon after the day’s adventures on the slopes, shopping, sight-seeing, (or a myriad of other possibilities) return to the Lodge and enjoy wine and cheese, hot cider, homemade soup, fresh bread, and other delights. As the day is waning, relax in the hot tub and snuggle around the outdoor fireplace at our romantic hotel in Colorado or in the comfortable surroundings of our Retreat Room. Visit with new-found friends under the stars while listening to music from our courtyard sound system. There is no better way to unwind from your day’s adventures. We invite you to stay with us at the Frisco Lodge and explore Summit County’s fabulous winter fun! 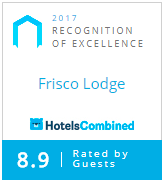 In order to provide the best experience to as many guests as possible, The Frisco Lodge is a non-smoking establishment, including marijuana. While we love pets, we are unable to accommodate pets at our lodge. Thank you for your cooperation. Click here to read our guest book!